Deep Creek, Hastings, Horsefly, Iron Springs, Turkey Creek, Specie, Sunshine, and Wilson mesas all offer remarkable views, tranquility and privacy. They are located between 15 minutes and an hour from Telluride and offer properties ranging in size from 5 acres to 500+ acres. Homes on these mesas start at $173,000 and range to $20 million. Lots range from $75,000 to $34.5 million. Going a bit farther afield you’ll find the communities of Norwood and Ridgway (in Ouray County) and Rico (in Dolores County). 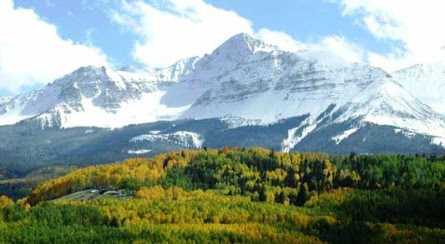 With breathtaking views in all directions including the majestic 14,000-foot peaks of the Wilson Mountain range, Deep Creek Mesa is home to some of the most spectacular developments in the Telluride region. Located northwest of Telluride, it is accessible by the historic Last Dollar Road which begins approximately 5 miles west of Telluride. Filled with meadows, streams, trails and wildlife, Deep Creek Mesa’s views, sunny orientation and privacy have helped make the communities of Aldasoro Ranch, Sunnyside Ranch, Diamond Ranch, Deep Creek Ranches and Gray Head some of the most desirable in the area. Home prices range from $1 million to $29.5 million. Vacant lots are still available for purchase with prices ranging from $400,000 to $16.8 million. Turkey Creek Mesa is home to Mountain Village, the Ski Ranches, West Meadows, Elk Run, The Preserve and Raspberry patch. Located south of Telluride the communities on this mesa have easy year-round access from Highway 145.